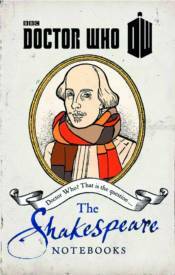 Newly discovered entries and drawings in William Shakespeare's journals reveal for the first time the astounding relationship between the Bard of Avon and the Doctor! BBC Books has rediscovered notebooks, long thought lost, compiled by the Bard in which he divulges the influential role the Doctor played in his creative life. Here are the original notes for Hamlet, including a very different appearance by the ghost; early versions of great lines ('To reverse or not to reverse the polarity of the neutron flow'); the true story of how the faeries of A Midsummer Night's Dream were first imagined; stage directions for plays adjusted to remove references to a mysterious blue box; and much, much more!